In 1 Timothy 6:12 the apostle suggests to Timothy, that he had other business to do than to mind the things of this world. His life was a state of warfare. He was a soldier, and was not to entangle himself with the things of this life. He had many enemies to engage with, such as Satan, and his principalities and powers; sin, and the lusts of the flesh; the world, and the men of it, and a great fight of afflictions to endure with them. Additionally, the false teachers, with, whom particularly he was to fight the good fight of faith, that the truth of the Gospel, which they resisted, might continue with the saints. It is a “good fight”, because it is in a good cause, the cause of God and truth. It is under a good Captain, Jesus Christ the Captain of our salvation; for which good weapons are provided. This includes the whole armour of God, which is not carnal, but spiritual and mighty. Those who are engaged in this fight may be sure of victory, and the crown of glory, life, and righteousness: so that when they have done fighting they have nothing else to do, but to take hold of eternal life. In the ADF, our mission field is the service men and women with whom we have the privilege to serve. We know what it is to fight in the physical battle space. Our fight is not against flesh and blood. It is against the principalities and powers in the spiritual realm. Our enemy is like a roaring lion that is looking for someone to devour. In my early days as a cadet at ADFA and RMC, there was an acronym that was drilled into us. That acronym is SMEAC: Situation, Mission, Execution, Administration and logistics and Command and control. 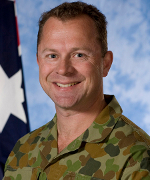 In 2006, I served as the Australian Contingent Commander in Sudan. In relation to situation, I needed to know my commanders intent; what my role was; the capabilities of the units in which I served; and how they operated together. Likewise, I needed to know who the Sudanese Armed Forces (SAF) and Sudanese Peoples Liberation Army (SPLA) were; who led these organisations; how they operated; what was important to them; their faith group; and what their views were of the United Nations providing a peacekeeping force. As Christians, we are deployed soldiers in the spiritual battle space. We can choose to engage in the spiritual battle space and utilise our training in the physical battle space to provide a mechanism to describe the spiritual battle space. The Bible provides us guidance about our situation in the spiritual battle space. A mission is a specific task to which a person or group is charged. In Sudan the United Nations Mission in Sudan (UNMIS) was to separate the SAF and SPLA forces to either side of the 1156 line which ran east / west across what is now north and south Sudan. Although there are a number of missions that could be drawn from the Bible, a well known one is referred to in the Great Commission. As Christians, our focus should be on the Great Commission. Our enemy, Satan knows this and will try to distract us from this mission through denominationalism, which impacts on Christian unity and attacks our identity in Christ through pride, shame and unforgiveness to make us distracted and incapacitated to take up the fight for the Kingdom of God. As service men and women, we are trained to act instinctively in pressure situations. When a round is fired, you instinctively fall to the ground to provide a smaller target area for the enemy. You do not however stay down. You work within a team to seek out and destroy the enemy regardless of season, weather or terrain. To be able to operate in a team, you need to master your own military skills, understand where you fit within the team and who you can call for back up. In Sudan, I carried a pistol, rather than a rifle. Although I was proficient with a rifle, I needed to understand how to use a pistol and relate to service men and women from different nationalities. Ephesians provides a great example of a spiritual warrior and spiritual weapons that are available to him. In Romans, we are shown how we can work together well with the gifts God has provided to us. As an Ordnance Corps officer, the motto is to the warrior, his arms. The warrior cannot sustain combat operations without appropriate support. Both the warrior and logistician need each other to operate effectively in the physical battle space. It is the same for our spiritual giftings. As the Contingent Commander, I was also responsible to provide the Force Commander advice regarding logistics. The military observers were often placed in remote localities. For them to undertake their jobs properly, they needed to be resupplied with basic commodities such as food, water and shelter. As Christians, we also need to be sustained for the battles we face. Developing our relationship with God through offering our bodies as living sacrifices, praying and reading the scriptures to renew our minds sustains us in the most difficult of circumstances. Christian unity is incredibly important. We all have our roles to play in God’s Army. I had separate command and control arrangements as the Contingent Commander back to Australia and as the Chief Logistics officer to the Force Commander in the United Nations. The Force Commander was from India. He enjoyed banter around cricket so I leveraged this to influence better logistic outcomes. Our relationship with God can influence outcomes here on earth. If you are seeking to do his business here on earth, your relationship with God makes a difference. We are fortunate as Christians to have Jesus as the commander of the Lord’s Army. He appoints us and we should serve him to the best of our ability. We can, where he places us. As Christians, we should fight the good fight of faith in the spiritual battle space. An approach to understanding the Bible’s guidance to us for how we can engage in the spiritual battle space is through SMEAC. We have to understand our commander’s intent and how our enemy operates. We need to understand our situation and prepare ourselves to engage in the spiritual battlefield with God’s help. This article was originally published in Crossfire no 26 – August 2015.